During the year 2018 Ostend-Bruges Airport welcomed 420.000 passengers and treated 28.000 tonnes of cargo. Compared to 2017, 420.000 passengers represent an increase of 15%. Almost equalizing the record of 2016 having 435.000 passengers due to the Terrorist Attacks in Brussels. The airport increased its cargo traffic with 20% compared to 2017 (23 500 tonnes). This upcoming summer season the airport increases its flights to Alicante (6 times a week), Malaga (6 times a week), Ibiza (2 times a week and 3 times between July and September) and Corfu (1 time a week and 2 times between July and September). Interest for cargo flights also increases since freight forwarders are in search of alternatives for the much congested airports of Liège and Schiphol. There were more occasional landings of the American cargo company Kalitta. Business and training flights have remained stable. In April 2019, the new Business Terminal will open. The largest holiday fair in Flanders will be held at Antwerp Expo this year, from Thursday Jan 24th till Sunday Jan 27th. Exhibitors at the fair will be divided in two groups: the close to home holidays and the far from home holidays. Our stand can be found in hall 4 at stand 4600 with the far from home holidays, meaning holidays for which you travel by airplane. At the opening, Thursday morning, we fly right into the action. From 10am to 12am all tour operators and other professionals will be welcome in the BLACK BOX in hall 1 (stand 1403), which has been rented out by the Airport. The BLACK BOX is an area that has been customized in order to inform participants, in a private and very hospitable atmosphere, of current and future flight offers. TUI fly (with spokesman Piet Demeyere), Flybe (with marketing director Bernd Behrend) and new company La Nova (with CEO David Roman) will demonstrate their strengths and illustrate their cooperation with the regional Airport(s). Marcel Buelens, CEO of both regional Airports, will start things off. Stand 4600 in hall 4 will prove itself the place to be at Antwerp’s Holiday Fair. The two Airports will highlight their destinations and bring the holiday atmosphere by integrating TUI fly and Flybe as subexhibitors in the main booth. For four days straight, the regional Airports and the two airline companies will indulge thousands of visitors with a fun and diverse series of gadgets. To top things off, every day there will be four duo tickets up for grabs. How to participate in the contest? The visitor will share their favorite destination: London or Ibiza! Each day the four photos with the most likes on Facebook or Instagram will be selected. The contest ends at exactly 5pm! At 6pm the winners will be announced! Thursday 20 December 2018 – Pobeda, low cost branch of the Russian Aeroflot Group, announced the launch of three weekly flights to Moscow (Vnukovo). This is an important extension of the airport’s network as it is for the airline since it is their first Belgian route. Flights will be operated three times per week as of March 7th 2019 on Tuesday, Thursday and Saturday. 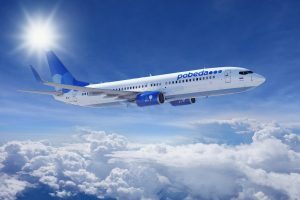 The Pobeda airline fleet consists only of 24 modern Boeing 737-800 aircraft. Seats on the direct flights from Ostend-Bruges to Moscow are now available www.pobeda.aero. Please note: flights start as of 7 March 2019. When selecting your flight, chose departure airport Bruges (Ostend). Full details will follow mid January.